THE DAVID VANDYKE RACING SEASON: DEC 1 – DEC 31, 2018. Three winners were added to the season’s honour roll in December. Champagne Daisy landed a second career win from only six starts. 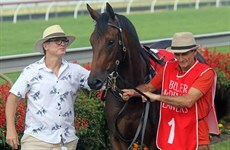 Both wins came in her last three starts with those results highlighting the pleasing progress being made by the three-year-old Conatus filly at this time. 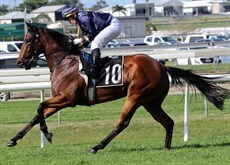 As with her Maiden win, Champagne Daisy latest success came at her home track … the Sunshine Coast … over 1200m. 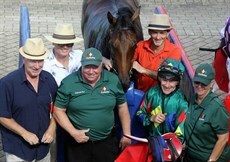 Champagne Daisy was the stable’s only runner at the December 9 meeting and they repeated their hit and run tactics three days later when their only runner Go Diamonds was too good for the opposition at Beaudesert on December 12, taking out a Maiden event in only her second start. 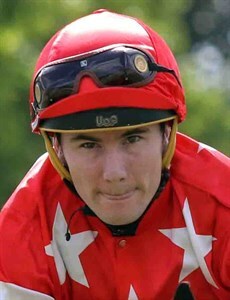 But arguably the most satisfying … and certainly the most exciting winner of the month, came in the form of Alligator Blood who not only won on debut on December 30 but did so in manner which showed a level of fighting character and determination which is not often prevalent with a horse trying to find his way on debut. It really was an amazing last stride win by the two-year-old … when it was easier to finish in the placings … and Alligator Blood’s debut effort can only bode well for the future. The stable also returned three second placings and two third placings in December meaning that 44% of the eighteen runners sent out by the stable finished in the first three in their respective races. CHAMPAGNE DAISY (3 b f Conatus – Stratella). 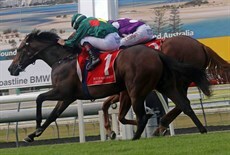 Dec 9: Sunshine Coast - F&M Benchmark 65 - 1200m. GO DIAMONDS (3 b f Reward For Effort – Legal Engagement). 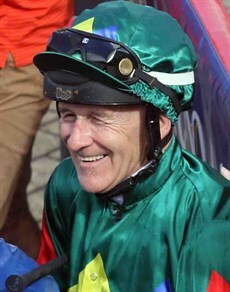 Dec 10: Beaudesert – Maiden – 1300m. ALLIGATOR BLOOD (2 b g All Too Hard – Lake Superior). 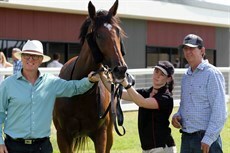 Dec 30: Sunshine Coast – Maiden – 1200m. Champagne Daisy had followed up her Maiden win on October 21 with a creditable second placing behind Light Up The Room (who would go on to run in the Magic Millions 3YO Guineas) over 1350m in town at Doomben on November 3. Here, five weeks later, she dropped back in distance to 1200m for a BM 65 contest and returned to home track action where she made no mistake under a confident ride by Jeff Lloyd, who had also partnered her to her debut win. Champagne Daisy (a short-priced favourite at $1.26) landed third at the jump. She had to ease momentarily off heels after 200m and then settled in fourth place, just over four lengths off the front-running Lips and Hips. Lloyd was content to allow Champagne Daisy to hold station in the early part but then he asked her to make up ground in the approach to the turn which she did easily enough to be perfectly poised to strike once the field straightened for home. 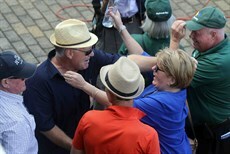 She didn’t take long to make her play, edging into the lead early in the straight. Champagne Daisy was always travelling like a winner from there. Although Miss Beneteau did emerge from the pack late but she provided little more than nuisance value over the concluding stages as Champagne Daisy, who did want to lay out late, went to the line with a comfortable half-length margin in hand. Go Diamonds faced her second career start at Beaudesert on December 12 where she jumped from the widest barrier in a nine-horse field in a 3YO Fillies Maiden over 1300m. Go Diamonds ($5.50) did not have the most fluent of breaks, jumping with her head in the air, but she mustered speed quickly enough after that and was in driving seat … in the lead … halfway down the back straight where she crossed to the fence under a good piece of riding by Michael Hellyer. Go Diamonds was then allowed to race well within herself until she brought the field to the home turn where Hellyer shook her up and began riding with more urgency. He had to. Coolwedge, who had tracked Go Diamonds throughout, simply refused to go away. In fact, Coolwedge moved up alongside Go Diamonds, headed her for a stride, and looked set to go right past the Vandyke trained runner, but Go Diamonds was not done for yet and the daughter of Reward For Effort rallied along the inside to regain her advantage which now turned into a winning lead. While this battle was going on Julianne’s Wish rushed up late on the outside but Go Diamonds was safely home as less than half-a-length separated the first three runners across the line. Now this was a win! Yes, it is always nice when a horse strolls in to win by five lengths to impress everyone with its raw talent but nothing quite beats a come-from-behind, last gasp victory after all had seemed lost just a few seconds before. Unlike that stroll in the park, winning from a seemingly hopeless position takes a combination of ability and commitment (heart) to achieve and when that package comes in the form of a two-year-old having only its first run, as it did here, the result deserves special mention. 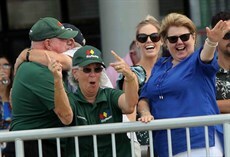 The All Too Hard, two-year-old gelding Alligator Blood, who had finished second in a trial over 850m at the Sunshine Coast on December 11, stepped out into competitive action for the first time over 1200m at the Sunshine Coast on December 30 where he did find good support, starting second favourite at $3.70 (Stampe was the $2.75 favourite). Stampe went out with only one aim in mind … to make every post a winning post. Early in the running the favourite forged four lengths clear at the head of affairs but by the 600m that margin had been cut to two lengths with Written With Ease leading the chasing pack. Alligator Blood was still second last, a position he filled from the jump, some seven to eight lengths off the leader and seemingly out of play. By the time the field straightened for home, Alligator Blood had done little to improve his position. Stampe still set the target and Written With Ease still led the chase and for some time it looked like these two runners would fight out the finish. Then, at around the 220m mark, Alligator Blood, still six to seven lengths adrift of the main action, suddenly started to lengthen his stride. Written With Ease had got to Stampe just inside the 200m mark and now it looked it looked like she had the race safely in her keeping but Alligator Blood just kept building momentum. Now four lengths back with 100m left to run, Alligator Blood continued to reel in Written With Ease with each passing stride. The leader was getting tired and Alligator Blood was flying. He was just over two lengths back with 50m left to run. It was down to a length soon after that and then came that last stride where Alligator Blood put his head down on the line to claim a really exciting victory … one for the notebook!